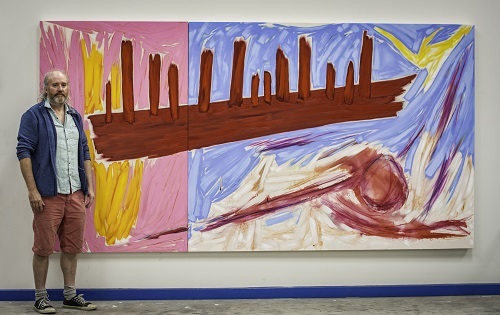 BOAT – New paintings by Ben Hennessy opens at GOMA – the Gallery of Modern Art and will be opened by Senator Grace O’Sullivan. The evocative image of a ‘childlike’ boat has appeared in many of Ben Hennessy’s earlier works, most notably in works presented in San Francisco in the 80’s. In this exciting new collection of oil paintings and vivid watercolours, the boat symbol along with other mythical imagery, as seen in the ‘Journey to Lir’ and ‘Alizarin’ series are reworked to reveal an uncompromising creative narrative that transcends myth and create a compelling visual feast. The highly painterly, new expressionist style – with big gestural marks, bold shapes and the energy of early de Kooning combined with the new development of splitting the canvas into heavily painted surfaces reminiscent of Sean Scully’s large canvases fuse to create bold, dynamic surfaces, making this exhibition the must see visual art event of the year. What is perhaps most striking is the use of delectable colour throughout the show – deep crimsons, vibrant pinks, vivid blues, purple, oranges and luscious ambers. Painted on these epic canvases, colour celebrates its own presence – vibrating and making the paintings hum with their own powerful, unique force. “Ben Hennessy has been using images in his work which reflect a human ambition to strive higher to stretch the imagination to the limits where man’s creative spirit is a triumphant part of how he lives” – Sheila Pratschke. The exhibition runs from 12th Oct – 12th Nov 2017. This entry was posted on October 12, 2017 by waterfordarts in Art, Exhibition, General and tagged Art Exhibition, Ben Hennessy, BOAT, Gallery of Modern Art, goma, Senator Grace O'Sullivan, whats on waterford.